“Scaly Coryphantha”, because the pericarpel of the genus has some scales, as opposed with Coryphantha, which is without scales. Genus of globose to elongated plants forming large clumps, with fleshy roots. Stems rather soft, with significant conicocylindrical tubercles, having a longitudinal groove, nectariferous glands sometimes present. Spines curved and flexible. Flowers diurnal, self-sterile, funnel-shaped, petals ciliate, intense pink to red magenta, with a darker midstripe, pollinated by hymenoptera and diptera. Fruits green with aqueous pulp, floral remains persistent. Seeds light brown to brownish, keeping the remnants of the mucilage. 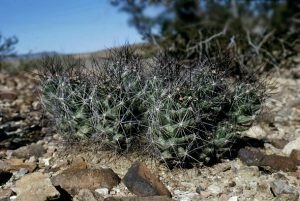 Although it is composed of one species and subspecies, the genus Lepidocoryphantha offers a wide geographic distribution, growing among grasses, in dry grasslands and arid mountains of the Chihuahuan desert, on clayey or gravelly soils, from 800 m up to 2230 m in altitude. Mexico (Chihuahua, Coahuila, Durango, San Luis Potosi, Zacatecas), USA (New Mexico, Texas).